Legumes such as cowpea, beans, and groundnuts are not only beneficial to human health as they are a rich and affordable source of protein; they are also beneficial to the soil. They fix nitrogen from the air into the soil improving its fertility thus, increasing the yield of other crops such as maize and sorghum when they are intercropped or in rotation. IITA has partnered with Kongwa District in their initiative dubbed “Eradicate hunger in Kongwa” (Ondoa Njaa Kongwa in Kiswahili) and are promoting legume production to not only improve the nutrition of the people but also boost overall farm productivity. This is through N2Africa, a large-scale, science-based “research-in-development” project focused on putting nitrogen fixation to work for smallholder farmers growing legume crops in Africa. In collaboration with Kongwa District authorities, N2Africa has established at least 150 pilot large-scale fields of about one acre each in 15 villages with lead farmers. 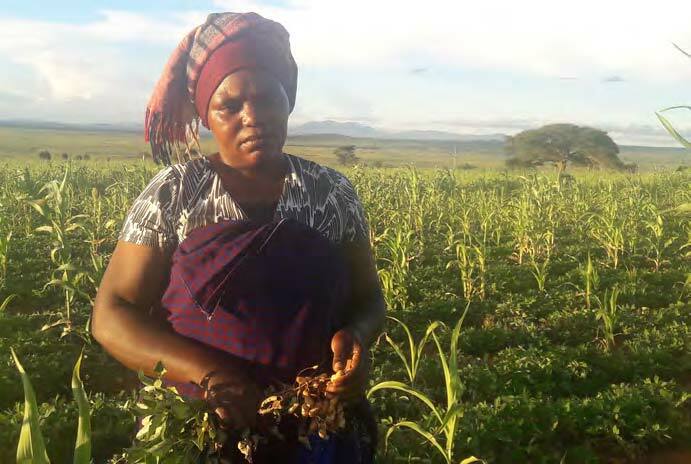 In 10 villages, the lead farmers are demonstrating intercropping of improved varieties of cowpea (Vuli and Raha) and sorghum (Nako), whereas in the other five villages, the improved variety of groundnuts (Pendo) is being intercropped with an improved sorghum variety. The project is also demonstrating improved agronomy practices such as application of phosphorus fertilizers and use of herbicides for weed control. 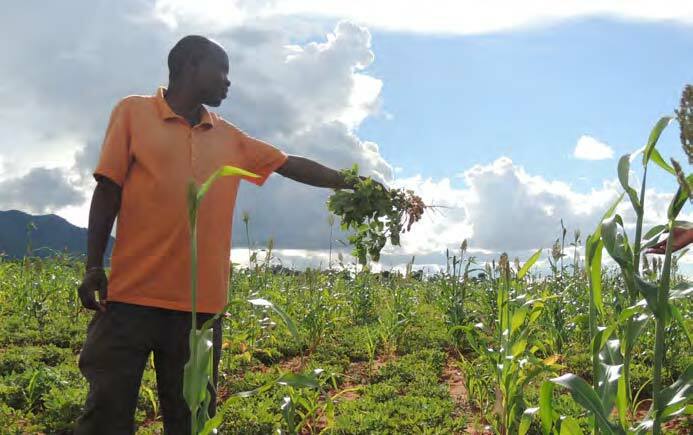 According to Mr Jackson Shija, the District Agriculture, Irrigation and Cooperative Officer (DAICO)–the district is expecting a good crop this year due to the use of improved varieties and intercropping with legumes and use of good agronomic practices. He said that farmers’ perception toward the intercropping of staple crops with legumes is positive following the good yield they are getting. “We need to continue training farmers to improve production and productivity,” said Shija. On the other hand, he said there is a need to continue ensuring consistent availability of seeds of the new improved varieties, building on the community seed growers approach that N2Africa has initiated in the area. Silvanus Andrews was happy with the intercropping system as it allowed him to harvest different crops at the same time. This was echoed by Jane Diamon, a groundnuts and sorghum farmer from Sagara B village: “The improved farming methods we are learning are far much better compared to the traditional ways we have been using. For example, I grew groundnuts using the new ways I was taught on a small area and I harvested a lot more compared to previous years. I expect to harvest even more in this coming season,” she said. Silvanus Andrew, a groundnut and sorghum farmer from Iduo village, shows off his intercrop. Christina Madege from Mlanga village tried the cowpea and sorghum intercropping and was quite impressed. “This is a good farming approach and has the potential to increase our income and empower us. Last year I had planted in a small land, and I harvested a lot of produce. This year, I have faith that I will get a good harvest as well.” A notable result is that cowpea gives them an early crop and shortens the period of food scarcity. She identified some of her major concerns as pest attack on cowpea and sorghum but said the project has supported them in knowing the right pesticide to use. Bilha Mtembozi, groundnuts and sorghum farmer from Sagara said, “When you mix sorghum and groundnut, you will gain from harvesting both crops. 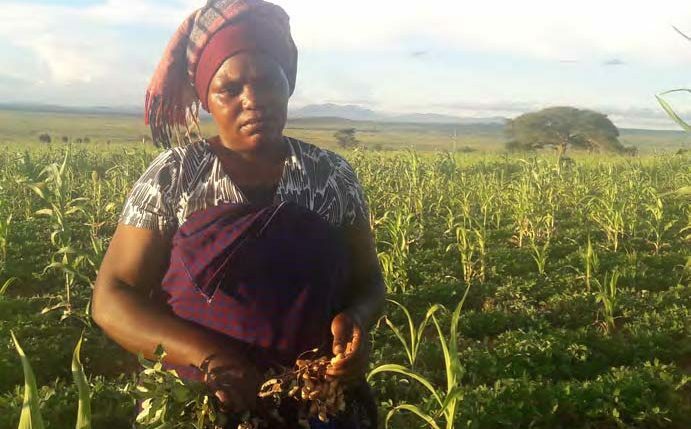 However, the challenge we are facing is the type of soils that we have that is highly exhausted of nutrients.” She acknowledged learning different ways to restore soil fertility including use of legumes, animal manure, and mineral fertilizers but points out availability and high prices of fertilizers as big limitations in their use.